Spring has arrived and the weather is glorious – what better time to visit Australia’s unofficial capital than in October? After being rugged up all winter, Sydneysiders are emerging from hibernation and finding a sunny spot in which to start celebrating the beginning of the warm weather. As October doesn’t fall in peak season, accommodation won’t be hard to find and flights should also be cheaper. With a long weekend at the start of October, locals will be in the holiday spirit all month so book a flight, pack your thongs and start exploring scintillating Sydney with these fantastic events. With hundreds of events taking part across the city throughout the month of October, you certainly won’t go hungry. 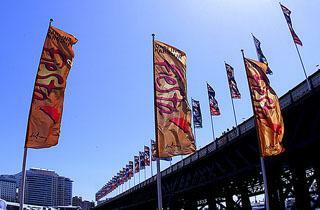 The festival kicks off with the annual World Chef Showcase, a weekend during which top chefs from around the globe, including Sydney’s own Neil Perry and Matt Moran, cook up their signature dishes in front of you and, best of all, allow you to taste them! 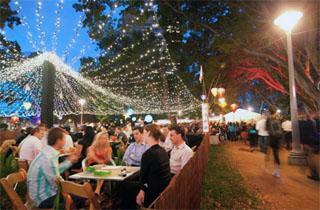 The popular night noodle markets turn Hyde Park North into an Asian hawker market, the Growers’ Market features nearly 100 stalls offering fresh, local, organic produce, and huge-scale picnics and street festivals pop up across the city. 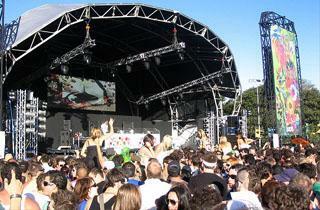 Australia’s best-known and most-loved music festival, Parklife features an eclectic mix of hip-hop, electronic, rock and pop acts from around the world. In a park close to the city centre, this year’s line up includes Gossip, Example, Magnetic Man, Nero, Simian Mobile Disco and The Streets and promises to be a sun-drenched hit. Tickets sell out quickly so getting booking now for a chance to be there! Surf City (September 24th-March 17th)This fascinating exhibition, displayed in the Museum of Sydney, allows a glimpse into Sydney’s massive surf scene in the 50s, 60s and 70s. Through surfboards from the time, movies, photographs, magazines, music, clothing and memorabilia, the exhibition vividly details the life of the surfer in that time and how those young surf-loving individuals who yearned for social change and strove for pleasure and escapism altered the face of the city. The October long weekend annually sees a colourful Latin fiesta played out in Darling Harbour, where Latin musicians entertain the crowds, free salsa and zumba classes are offered, professional tango and flamenco dancers show the rest of us how it’s done, and Brazilian carnival queens strut their stuff to Latin beats in the fabulous parade. After all that dancing, you can head to one of the many stalls where a mouth-watering range of regional dishes awaits you. Petrol heads shouldn’t miss the 1,000 kilometre motor race for touring cars at the iconic Mount Panorama race track. Running for almost 40 years, fans and broadcasters refer to it as ‘The Great Race’ and it is the undeniable pinnacle of Australian motorsport. Part of the V8 Supercar Championship Series, the stakes are high and the atmosphere is electric. Emily Buckley the author of the “Sydney’s top events in October” is a regular writer for HotelClub, a world-leading accommodation website offering 71,000 accommodation choices in over 7,400 cities worldwide. HotelClub delivers discounted hotel rates at up to 60% off throughout the year and offers a flexible service and worldwide coverage, including accommodations in Sydney.